I have received a number of phone calls and emails regarding variegated cutworms on alfalfa. This damage is likely from migrating moths although some overwintering is likely. Phil Pellitteri, UW Entomology, and Krista Hamilton, WDATCP, have reported intense moth flights and egg laying in the northern part of the state. However, my calls have also included alfalfa in the southern region as well. Incidentally, yellowstriped armyworm has also been found in mixed populations with variegated cutworms. Variegated cutworms moths are nocturnal. The forewings are dark brown with mottled designs and are approximately 1 ½ in long. The hind wings are lighter in color. Larvae are up to two inches long, vary from light to dark brown and curl up into a ball when disturbed. The distinguishing characteristic is a single row of yellow dots on the back. Not all segments will have this yellow dot but they are more pronounced in the middle segments. Variegated cutworms feed on a wide variety of ornamental, field and vegetable crops. 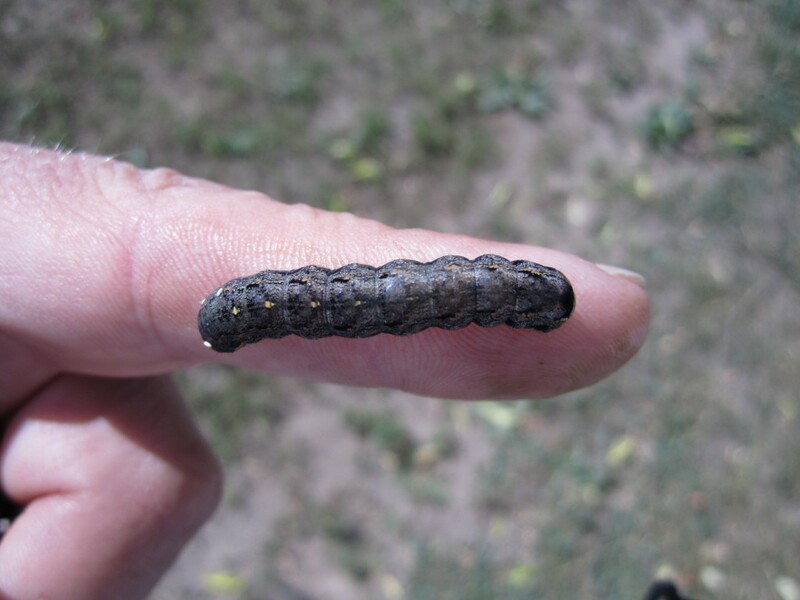 They are a climbing cutworm that feed on foliage and usually don’t “cut” plant like black cutworms. 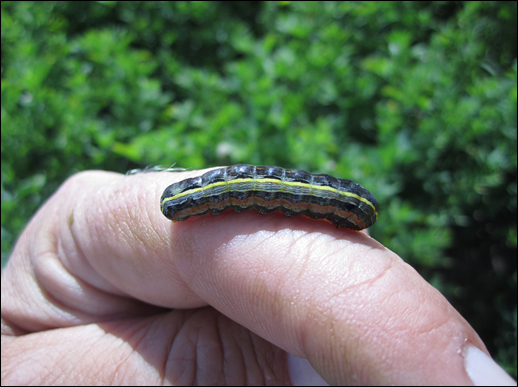 Yellowstriped armyworm larvae can be up to 1 ¾ inches long are usually grey to black in color. Their distinguishing characteristic is two distinct yellow stripes on each side of their body. Like variegated cutworm, they are a foliage feeder with a wide host range that includes both grasses and broadleaved field and vegetable crops. In the southern part of the state we are very close to harvest and that should be your first control option, if feasible. Most of my concern would be protecting the regrowth. These larvae can survive harvest and would likely start feeding on newly formed crown buds or shoots. Their survival could be increased by hiding under the windrow. Don’t automatically assume the lack of green up is a result of variegated cutworm or yellow stripped armyworm feeding. Lack of rain can certainly be a cause this year. Although nocturnal feeders, variegated cutworm (and yellow stripped armyworm) are relatively easy to find. Inspect the soil surface, under leaf litter and cracks in the soil to confirm the cause.